A community festival celebrating diversity in Carlisle was given a £2,000 cash boost from the Abbeyfield Society Community First Fund. Carlisle Unity Festival, organised by AWAZ Cumbria and their partners, One World, was aimed at building unity among the many diverse groups in the city while tackling prejudice and promoting understanding. 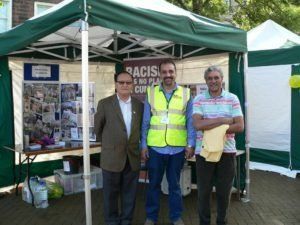 Charities that work with ethnic communities and minority groups showcased their services and the range of activities on offer within the community. Stallholders included Carlisle Refugee Action Group, Carlisle Mencap, the Terrence Higgins Trust, Palestine Solidarity Campaign and Carlisle Lions Club. Local people were able to share and learn new skills and had the opportunity to experience a wide variety of food and music, and enjoy performing arts from around the world, in Carlisle City Centre. Cumbria is one of the least diverse counties in the UK, but this is beginning to change. Carlisle is becoming increasingly multi-cultural and diverse, yet there is a lack of opportunities for communities to come together and celebrate their cultures. Minority and marginalised groups living in the city face issues such as racism and islamophobia which has been documented in recent hate crime reporting by Cumbria Constabulary. Aftab Khan, Development Officer at AWAZ Cumbria, hopes the event has increased awareness and understanding of the barriers and issues these groups face. He said: “There is a need more than ever to demonstrate that people and communities are united in their spirit and action against any kind of intolerance, hate and xenophobia in Carlisle. “Carlisle’s first Unity Festival brought together a range of community groups and organisations to stand up to prejudice and show their community spirit in a time of great uncertainty.